Liquid Fireworks are providing the best custom musical fountain shows available. These can be placed anywhere, as they can be small or large depending on the client’s request. We are also able to feature overhead lighting which can be electrically raised higher or lower to meet your requirements. Musical fountains are perfect if you are looking to attract a crowd. We are capable of creating the perfect musical fountain for your company; we can base it around what you want and we also create the musical fountain to form shapes of your choice. The whole service will be based on all of your requirements and we will be able to achieve this as our quality is unmatched and all of our services are designed to be reliable and great value for the client. Why choose Liquid Fireworks for a custom musical fountain show? Our musical fountains are installed with complex aesthetic images created using timed sound waves that work with lasers to reflect lighting on the water particles. We use high-tech dichroic filters so that the lights are much brighter than normal fountain lighting. Our team has the experience to provide you with a musical fountain based on your exact specifications. 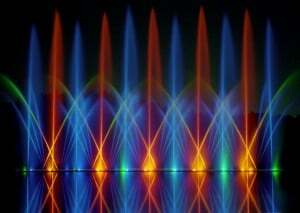 We have been providing bespoke dancing fountains for over 70 years and we have become the biggest musical fountain company in the world. Our family was the first to invent the musical fountains and over the years we have worked on major projects in places such as Disney World, Seaworld and the Universal Studios. Liquid Fireworks host large events all over the UK such as the Waltzing Waters on Isle of Wight which millions of people all over Europe go to visit every year. Our friendly team of experts here at Liquid Fireworks are more than happy to help with any inquiries or bookings. Get in touch by calling us on (239) 574-5181 or email at sales@liquidfireworks.com and we will get back to you as soon as possible.